As I am typing this blog post the eleventh miner has just been rescued, Bolivian President Evo Morales is visiting the Bolivian miner who was trapped in the mine, and preparations are underway for the rescue of the 12th miner. This truly is a wonderful day! After being trapped underground for over two months, the miners are getting to see their families, breath fresh air, and feel the warmth of the sun on their faces. We need to thank God that these men were not lost in a horrible tragedy; that the Chilean people did not give up; that they continued in hope, and that they are performing one of the most dramatic rescues in history. Please continue to be in prayer. There are still 22 miners awaiting their rescue. Pray for their psychological stability, their health, and the smooth running of the equipment being used to extract them. And may we all praise God for this amazing and heroic rescue. 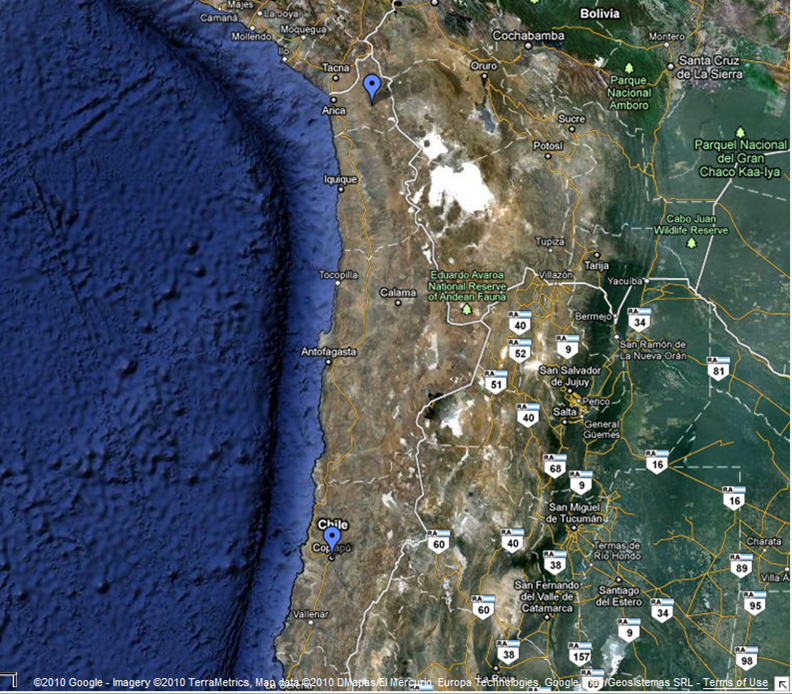 This map shows the distance between Copiapo, where the mine is, and Ticnamar, where we will be serving. This entry was posted in Uncategorized and tagged Chile, Copper, Mining. Bookmark the permalink. I watched much of it on TV. It was amazing. So what is the distance from the mine to where you will be? As the crow flies, it’s about 615 miles from the city we’ll be living in. The village we’ll live in will be farther, but I’m not sure by how much. It’s all the same desert, the Atacama. It was quite amazing. A miracle, really, and a proud day for the country of Chile.